We hear about bullying every day. It is a widespread problem in our society. Bullying occurs in education, in the workplace, and in some families. Physical and psychological abuse of a human being in her social group characterize it. Evidently, many people suffer from this problem, especially students. Some students decide to give up school. Sometimes, there are cases of suicide. 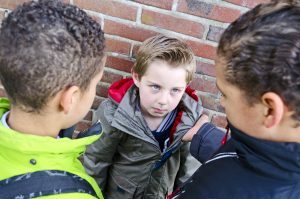 It is essential to understand the most objective factors, which cause bullying at school or in the workplace. I am going to analyze this problem in detail to understand the cause of bullying and its effect on young people. The most evident reason for bullying is a difference. Every social group consists of the definite number of individuals who are equal. Young people try to look like one another to live in peace and harmony in their group. When one child differs from the rest of his team, he is at the risk of being abused. Finally, the most obvious targets of bullying are weak individuals who cannot protect themselves. Consequently, a sick child who does not want to look like an average member of this group can become the target of bullying. Very often, students who wear glasses are abused, because they are ‘unpopular’ and physically weak. Stronger boys and girls usually behave harshly to establish their dominance in their groups. Then, some students who belong to another ethnical background or have different religious views become targets of bullying, because they are different. Young people cannot think objectively, and they live according to the existing prejudices and stereotypes. When they see someone who is different, they believe that he is their enemy or rival. Bullying is caused by poor bringing up. Naturally, every child copies the behavior of his parents, because he sees their actions and lifestyle every day. Very soon, this practice becomes a norm, and he will behave in this way all the time. It will be difficult for a child to change his behavior because his actions and style of communication have become automatic. It is possible to say that parents influence their child seriously. When a child sees that his father hits his mother, he will copy this behavior. He will beat his girlfriends at class because he thinks that it is a norm. Finally, many bullies are neglected. They do not receive enough attention from their parents, and they try to attract the attention of others with the help of the rude behavior. Sometimes, bullying is the only method to draw the attention of parents. A child behaves rudely to show the lack of attention to his parents. Wise parents and teachers manage to decipher these psychological signs. The next cause of bullying is a false motivation. Everybody knows that bullies are often the natural leaders of their groups. When they behave negatively, the members of the groups support and motivate them. When a bully hits a weak child, they will laugh and reward this behavior. Consequently, every bully is an actor who performs his role for his audience or fans. He enjoys being in the spotlight, and he tries to amuse and entertain his friends. Furthermore, he wins their respect and social status in this way. Everybody is afraid of a bully, and he tries to support this reputation even if does not want to abuse others anymore. Finally, some bullies cannot control their own emotions. When they are angry, they react spontaneously. They do not think about the consequences of their actions. To sum it all up, bullying is a severe and relevant issue, which requires in-depth research and practical solutions. It is essential to understand the real causes of bullying if we want to defeat this problem in future. We should learn how to bring up children well to change their behavior for the better.